Merriam-Webster’s definition of weak: lacking the power to perform physically, mentally or emotionally. This is our society’s definition of what it means to be weak. It’s just a little bit wrong. It states that to be weak you are “lacking” power. I’m here to explain that weakness is actually an incredible power unto itself. The term “weak” has a strong taboo tied to it. People have been running away from it for centuries and have been persecuting themselves for having it. Envision a scale with weakness on one side and strength on the other. One can see that the strength portion is completely out of balance. Everyone strives to be strong. To be weak is to be considered less than. But here’s a snippet of truth: weakness is a beautiful power that is a part of the 5th dimension. Weakness is a power that is held in both the masculine and the feminine, yet many do not know how to access it. To access your inner weakness is so easy that it hurts. To harness weakness, one just needs to lie down literally or figuratively and just let whatever happens……happen. To officially step into your power of weakness is to prove that you have accessed your strongest self. You have realized you have been the absolute strongest you can be and it dawns upon you that there is a whole opposite end of the spectrum to explore. To allow yourself to be weak is a huge step bc it means you are putting aside a huge part of your ego. The ego will always push you to be strong. It is that strength that keeps ego alive. But to realize that there is a whole new concept of power that has nothing to do with strength, your ego will fall to the wayside. Your ego simply doesn’t know how to not be strong. To harness weakness is to call upon a power that is purely spiritual and virtually ego free. Another major beauty about weakness? It is a huge catalyst in destroying things that need to go. Things that need to be destroyed can be both things inside of you and things in your external world. Do you remember a time when you were in severe pain? This could be mentally or physically. Were you trying to stay strong during this pain? Trying to put up a good front despite how awful you felt? What do you think would have happened if you would have just given in and just let your self be weak? I’m going to go out on a limb and say that if you had let yourself be weak…..you would have caved. You would’ve broken down and completely crumbled into a crying heaping mess, right? You may have even wallowed in that state for a pretty long time. But then something would have snapped. In your decision to let yourself be absolutely weak, you would have accessed a huge power. The power to break. And from that brokenness, something new would emerge. The power of weakness is much faster than strength. If you let yourself finally be weak, you get to a new state of being very quickly. Sometimes instantaneously. Versus staying strong in a situation for weeks, years, decades? Here’s another aspect of the 5th dimension: there is no pain here. Let me say this again……there is no pain in the 5th dimension. Oh my god?!??! Is this paradise?!?! Not exactly. In order for anyone to reach the 5th dimension you have to rid of your pain. Pain is not a back pack you can just dump off and run away from. In order to reach the 5th dimension, you must un-pack that back pack and experience all of that pain. One may sit here and say “But I’ve seriously come to peace with all of my stuff in this life!”. Well good for you! But guess what? There’s all those other lives you’ve experienced in the past that are riddled with pain. You must access that and experience all of it in its entirety. To finally feel it as a whole, you can finally release it and ascend into the cosmos like a MF’er. But I’m getting ahead of myself. How do you access this pain in order to help yourself enter into the 5th dimension? It is through the power of weakness that you finally get rid of that pain. In the entirety of time, we have all suffered to the utmost degree. And in this dawn of ascension, we are all called to feel that stuff that has been lingering in our soul for……..forever. It is time to release that crap so that we may experience an existence where there is no pain. How is there no pain in the 5th dimension? 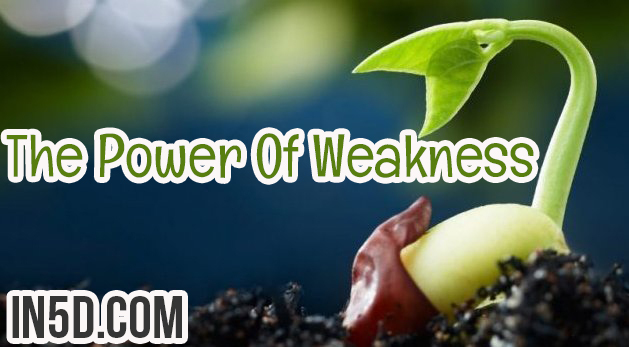 Bc everyone can harness the power of weakness. For everyone to use weakness early on in a conflict is to not allow the conflict to happen at all. Pain is completely avoided because everyone in the 5th dimension knows how to use weakness. So how exactly do I access my inner weakness? Think about what weakness means to you. What parts of the definition make you cringe? Find those cringe worthy aspects of weakness and just meditate on them. If something comes up that truly makes you feel uncomfortable, take a slow deep breath and let yourself just be weak. Don’t try to positive-talk yourself out of it and don’t try to physically brace your body. Just crumble up and let go. It’s gonna feel completely weird. You’re gonna feel absolutely helpless and pitiful. Just stay in that space and breathe. Everyone’s experience will be different, but I can definitely tell you something new will happen. Weakness is beautiful and it is here to be harnessed to our highest good. Let us all learn to be weak so that we all may change the negative energy tied to it. Let us all be weak so that we all may finally access our highest selves. Love, light and understanding my homies! About the author: I’m a nurse turned Reiki practitioner. I also happen to have an intuitive ability to see and heal people’s past lives. So many of us suffer from physical symptoms, fears, inexplicable behaviors and life decision patterns that simply do not make sense in this life time. That’s where I’m here to help! I utilize the healing art of Reiki along with my intuitive ability to help you access and heal all that no longer serves you. Messages from guardian angels and loving messages from deceased loved ones are also common when healing past life trauma. Visit me at www.mmpastlifehealer.com to find out more or to book an in person or distance session!